Parts of Sydney’s monorail, which was taken down late last year, have been used in the construction of the North West Rail Link (NWRL). 60 beams from the monorail have been converted into 29 girders, each 32m long, used to build a bridge at the location of the future NWRL Norwest Station so that cars can continue to travel through the area during the station’s construction. 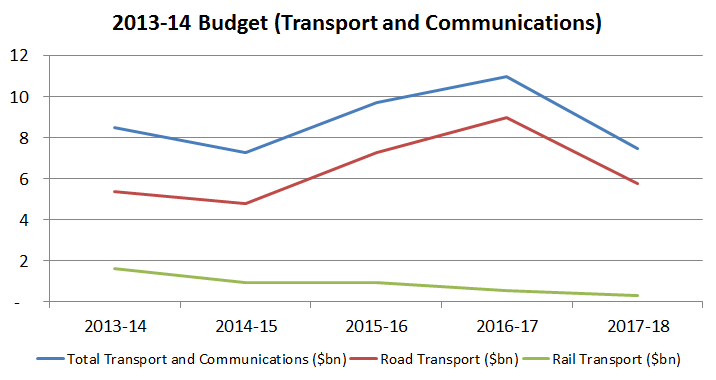 The 2014-15 Federal Budget includes $30bn of spending on land transport over 4 years, of which $26.9bn (91%) is for roads and $2.8bn (9%) is for rail. These form part of a $50bn infrastructure program over the next 6 years, of which $11.6bn is new spending. However, much of this has been achieved by re-allocating funding from rail projects to road projects, with Shadow Transport Minister Anthony Albanese disputing the budget figures in what could be classified as the worst game of pictionary in Australian political history. A return to fuel excise indexation, raising an additional $2.2bn over 4 years. The creation of an asset recycling fund for states that privatise state assets to pay for new infrastructure, worth $5bn over 5 years. 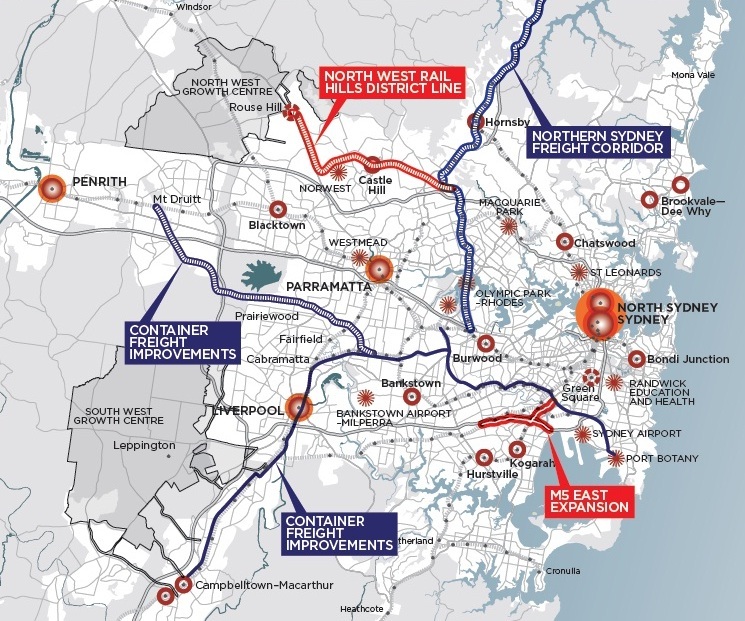 The previously committed funding for WestConnex, worth $1.5bn, as well as a $2bn low interest loan to the NSW Government. The previously committed funding for NorthConnex, worth $405m. A roads package to support a future airport at Badgerys Creek, worth $2.9bn over 10 years. More than 3,500 additional public transport services will be provided during the two and a half week long Vivid Festival. 800,000 visitors came to see Vivid last year, and overwhelmed the transport system. The additional services include 3,200 more bus services, 350 more train services, and 132 more ferry services. Together, these will add capacity for over 660,000 passengers over the period of the festival. As a comparison, Sydney’s rail network has a maximum capacity of around 150,000 passengers during the busiest hour of the morning peak. This follows criticism of last year’s Vivid Festival, where visitor numbers were underestimated and insufficient public transport services were provided. In particular, no additional train services were provided in 2013, nor were any additional services of any kind provided for the Sunday of the long weekend (which was also the final day of the event). Planned bike paths through the CBD may remain uncompleted until the end of the decade if not finished by next year. The final plan for the CBD bike network was only completed in December 2013, with bike path construction put in limbo in the 2 1/2 years since the 2011 NSW election in order for the network to be planned out. However, the Sydney Morning Herald reports that the NSW Government is hesitant to have 2 major construction projects in the CBD running at the same time, so any bike path construction will be put on hold while light rail is built through George St in Sydney’s CBD in order to minimise traffic disruption. This could begin as early as April 2015, with the line scheduled to open in 2019 or 2020. 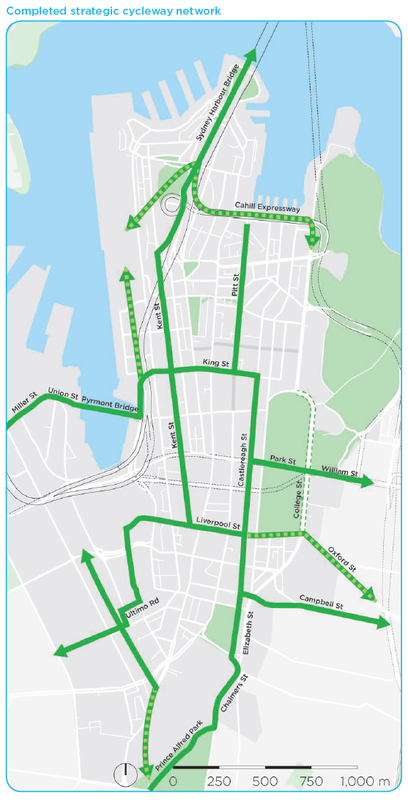 Once completed, a network of separated bike paths will create a loop around the central CBD, linking up the existing Harbour Bridge to Pyrmont Bridge connection to a number of other streets to the South, East, and West of the CBD. This is post number 150 for this blog, which has now been running for almost 2 years since it began in August of 2011, the month after the author of this blog visited every station in the Cityrail suburban network in one 24 hour period using only the rail network to get around (video below). In recent months, a typical week will see this blog get 1 or 2 new posts, receive about 1,000 hits, representing 500 unique visitors, generating 3 comments, and being shared 3 times on social media. About 100 of those visitors are regular readers (RSS feeds, email subscriptions, etc) or referrals from social media, while the remaining 400 are split fairly evenly between web searches and image searches. 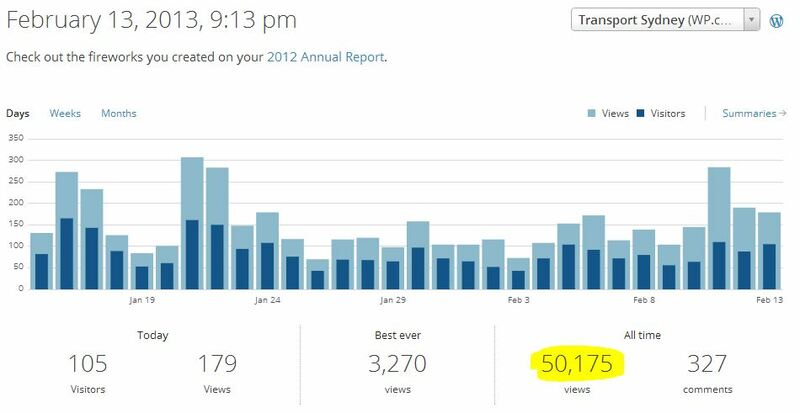 Last month, this site passed the 50,000 hits milestone. It’s worth re-visiting some of the posts which were read and commented on a lot during that time. The most viewed post was one which was not really covered by the TV, radio, or online media, other than ones falling for the initial hoax. The lack of any competing source covering this story led to this particular post going viral, with 85 tweets and 178 shares on Facebook, including by the University of New South Wales, resulting in 3,270 hits on 31 July 2012 alone. The second most viewed post, written in the first few weeks after this blog was started, is about different ways in which fares can be calculated. It is likely to remain an item of interest as Opal is rolled out and the possibility of integrating fares in Sydney is considered. It is interesting to note that none of the 5 posts in the first list (most viewed) are repeated in the second list (most commented). As a general rule, people are more likely to comment on a post when they disagree with it, while they share it on social media when they agree with it (leading to more views). That probably explains the difference in each list. The posts about the Northwest Rail Link and Sydney Airport in particular were great examples of commenters who disagreed with the contents of the post. Both the articles, along with the comments and follow-up responses, are a fantastic read for anyone looking to get a more in-depth discussion of those particular issues (but doesn’t who want to dip their feet into the world of online transport discussion forums). A more recent proposal which received government approval last month, but seemingly less media coverage or public interest, was the conversion of a portion of the former Goods Line at Ultimo into a public space. It too has been dubbed as Sydney’s version of the High Line. Importantly, this proposal represents both a destination as well as a means of getting from one place to another (New York’s High Line is mainly the former, while the monorail proposal was entirely the latter). It is this combination of factors that Jesse Adams Stein, blogging as Penultimo, argues will make The Goods Line superior to the High Line, and I think that hits the nail on the head. 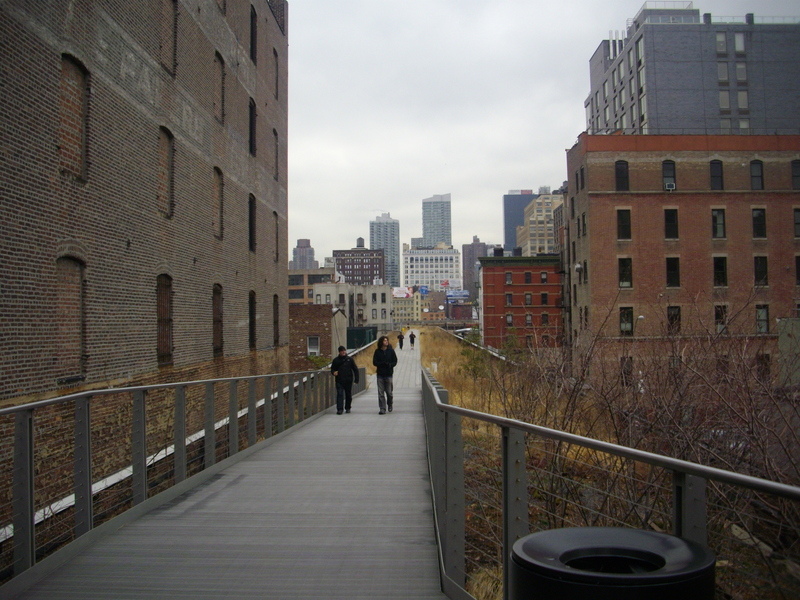 I was in New York earlier this year and visited the High Line on two occasions. 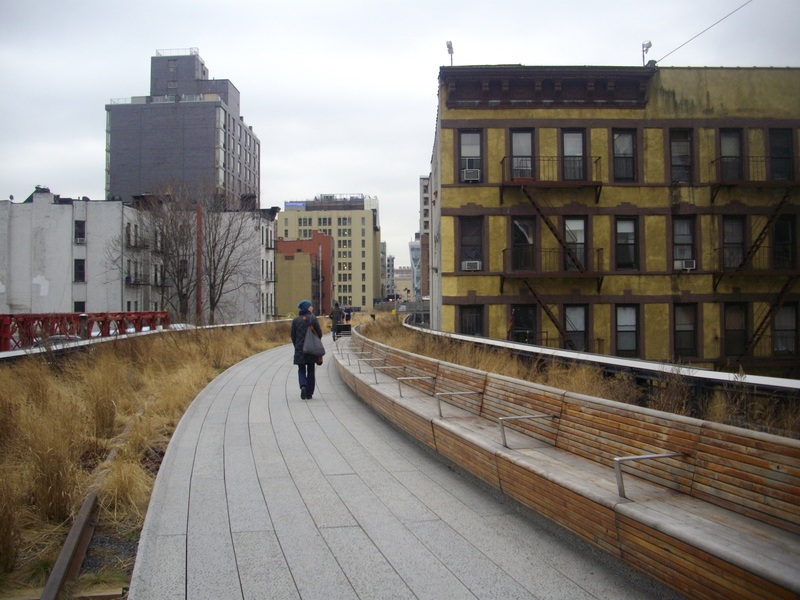 It’s a great piece of public space, a former elevated rail line converted into a public park and walkway. But it doesn’t take you anywhere you want to go, it’s just a destination. So by the time you finish walking to one end, it’s time to turn around and go back the way you came. The Goods Line, on the other hand, will connect up to the Devonshire St Tunnel, allowing a pedestrian to walk North from Central Station at Chalmers St all the way to the Powerhouse Museum unimpeded. Sydney’s CBD actually has a fairly good collection of pedestrian links at the moment, and is adding to them. A collection of major ones that currently exist or are planned are shown in the map below (blue are underground tunnels, green are pedestrianised surface spaces). Right now, a pedestrian across the road from the George St Cinemas can take an underground passage to Town Hall Station, through the QVB, across to Myer and come out the other end at Pitt St Mall. All of this without having to worry about vehicle traffic or the elements up on the surface. Continuing North for two blocks past the pedestrianised Martin Place is the Eastern entrance to Hunter Connection, which will take you to Wynyard Station, where another underground tunnel (soon to be the upgraded Wynyard Walk) takes you through to Barangaroo. By the end of this decade, a large chunk of George St will also be pedestrianised, and one of the features of the redeveloped Darling Harbour will be a pedestrian boulevard running North to South. When it comes to transport, we are all pedestrians at the most basic level. So it’s good to see a bigger emphasis being placed on creating good quality public spaces that prioritise people above vehicles. As with any good media mistake, the recent UNSW monorail hoax that was picked up by the ABC, MX and 2UE ended up on the ABC’s Media Watch program, mostly mocking David Oldfield from 2UE. Worth a watch. A bit short for time this week, so that’s all for now. Will hopefully have something more substantial next week. What will an Abbott Government mean for transport in Sydney? At the Liberal Party Conference on 30 June, Opposition Leader Tony Abbott declared that a Liberal Government would commit $4bn to road projects in Sydney, Melbourne and Brisbane. For Sydney, this translated to $1.5bn for the M4 East. This decision was clearly made on political criteria, rather than planning and transport criteria. It funds the projects where the benefit flows primarily to the marginal electorates, rather than where the the benefit is greatest. And unfortunately, it’s a bipartisan pattern that is emerging in Commonwealth-State infrastructure funding, with the Gillard Government making a similar mistake when it declared that it would provide $2.1bn of funding towards the Parramatta to Epping Rail Link (PERL) prior to the 2010 election. In that case, Julia Gillard at least consulted with the state government first and got them to fast track the PERL. 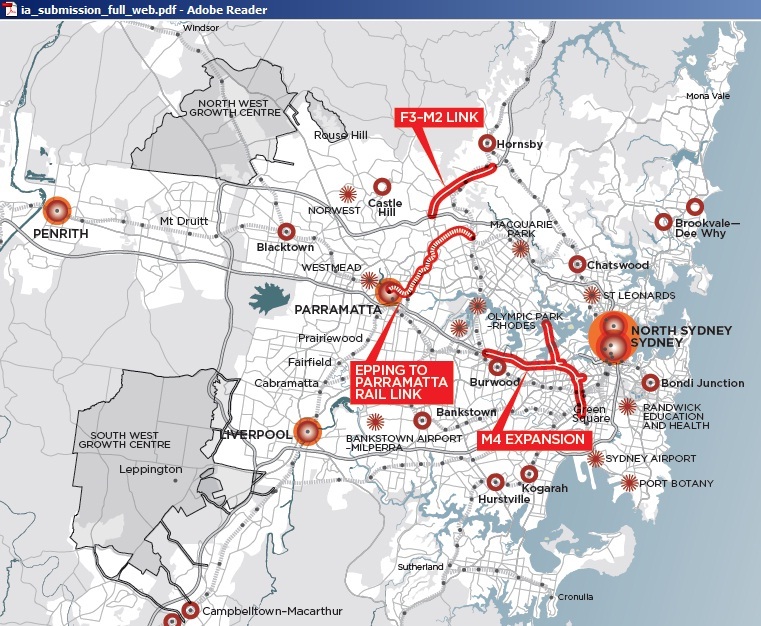 But Mr Abbott hasn’t done this prior to his announcement, and the NSW Government currently appears to be planning to build the M5 East duplication and F3-M2 Link rather than the M4 East. The other problem with Mr Abbott’s offer is that it represents only a fraction of the total cost. While the majority of the cost of the PERL ($2.6bn at first, though later blowing out to $4.5bn) would be borne by the Commonwealth, the M4 East has a price tag of between $5bn (for a short route between Strathfield and Ashfield) and $10bn (for the long route that also links it to the airport at Mascot). This leaves the state government out of pocket by $3.5bn-$8.5bn, compared to $0.5bn-$1.9bn for the PERL. In both cases the problem remains that the Australian government seems to want to pick the infrastructure that the state should build, rather than trying to fit it into the long term metropolitan plan the state has developed for the city. The ridiculousness of Federal Labor insisting on funding the PERL over the NSW State Government’s preferred Northwest Rail Link (NWRL) can be seen in comments by Infrastructure Australia in which it declares that the PERL is an inferior choice than NWRL (its concerns surrounding the NWRL aside). The NSW Liberal Government takes a different perspective on the role of public transport, having not only made the NWRL its centrepiece but also buying the monorail and light rail, reverting them from private to public ownership (albeit still privately operated). They’ve done this presumably out of a realisation that roads do not have the capacity of public transport, and that congestion is costing the economy in potential output. When it comes to a second airport for Sydney, the 3 most powerful Liberals from Sydney: Mr Abbott, Shadow Treaurer Joe Hockey and Shadow Cabinet Minister Malcolm Turnbull all support a second airport in the Sydney basin. Only Mr Hockey has named a preferred site so far: Wilton. None seem to be pushing for Badgeries Creek. However, Nationals Leader Warren Truss, who is also the Shadow Transport Minister, doesn’t think Sydney needs a second airport, putting him in NSW Premier Barry O’Farrell’s camp. Should Mr Truss hold on to that portfolio in government, then it seems unlikely that Sydney will see a second airport while he and Mr O’Farrell control the levers of power. The Federal Coalition also supports completing the construction of the Pacific Highway. The completion of this project is currently uncertain as the NSW government insists that funding continue to follow the 80%-20% split where the federal government contributes the majority of the funds, while the federal government is insisting that past 2014 all federal funding would only match state dollars. Mr Truss has mentioned he would consider the suggestion by NSW to transfer the $2.1bn earmarked for the the PERL towards the Pacific Highway, which would cover the shortfall. This again suggests an anti-rail bias by the federal Coalition. Google has added bike paths to its Google Maps service. You can now plan your trip to take bike paths into account. They are separated into off-street, on-street and “bike friendly streets”. Some quick browsing through it reveals that it is still a work in progress, with some bike paths missing or inconsistent (i.e. in some places a shared pedestrian/bike path is classified as off-street and sometimes as on-street). Still, this is a big improvement, along with the addition of traffic that was added recently. 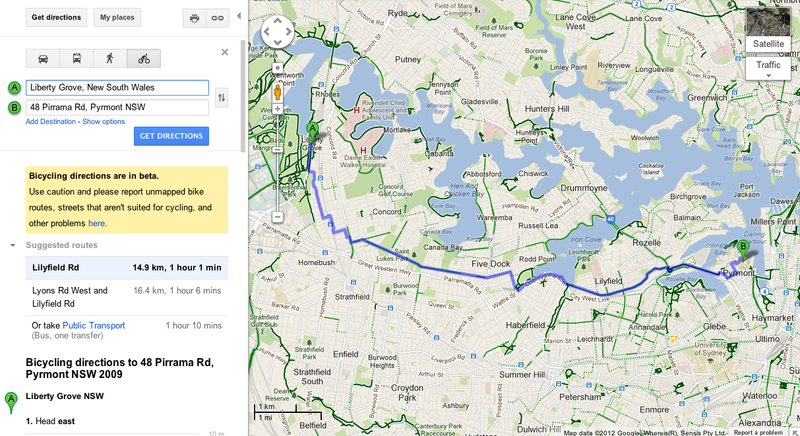 What Google Maps is still missing in Australia is good Google Transit functionality. It’s almost non-existent in Australia, with Sydney having only the light rail and monorail built in. Sydneysiders can use something like 131500 or the TripView app to get directions, but I found neither of them to be as user friendly as Google Transit was when I used it while travelling in the US.